Add Happy Lighting to Your Party. 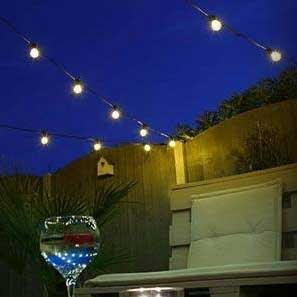 Create a happy vibrant feel with Festoon Lights in your garden, perfect for party lighting, warm ambient light will transform any outdoor space. Add friendly nostalgic bulbs up to 600 m long. We offer superb multi length discounts, the more you buy the bigger the discount. So easy to install simply string up the led bulbs, plug them in & turn them on. Then sit back & enjoy a truly wonderful atmosphere that only festoon lights can give. Low Voltage to Commercial Bulb Displays. Our festoon range covers everything You need. From low voltage led bulbs to commercial connectable strings, in a choice colours, cables, shapes and sizes. Ideal for community high street displays. Connectable Festoon lights can be plugged together in a long string. Some can be joined up to 600 meters in length from one plug. A very popular choice for party lighting, festoons add bags of character to any celebration. If you need longer lead cables we have options for a 5m lead wire. Choose Your Colour, Bulb Style and Cable. We offer a choice of white or black cable to fit in with your background. You can buy cable clips from our accessories section, to mount the strings on walls. Clear or Frosted led bulbs, in traditional Bistro or Vintage style to suit your occasion. Bulbs in white, multi colour, & warm white lights for a more sophisticated look. The large bulbs are a perfect choice for feel good parties, they look wonderful as wedding lights, and add funk to festivals and celebrations of all kinds. Create a magical Christmas string light display with multi coloured bulbs. Warm white make a perfect light canopy for a memorable summer party. Perfect for Parties Weddings & Special Occasions. Outdoor Festoon lights are really great for parties, they make everyone feel happy! You can transform any area in minutes. The bulbs refract the light in a magical way, they add a friendly happy feel to any outdoor space. The Clear bulbs give a real funky retro modern look. Perfect for the Home & Garden for a festive decorative display. Create a funky sophisticated atmosphere for bars & restaurants, with our retro bulbs. The outdoor bulbs can also be run indoors, some companies choose this option because outdoor strings are more durable.